An actor, a nun, and a recluse come home to Cape Breton to hold darkly comic vigil through a family crisis. Sound like an old joke? 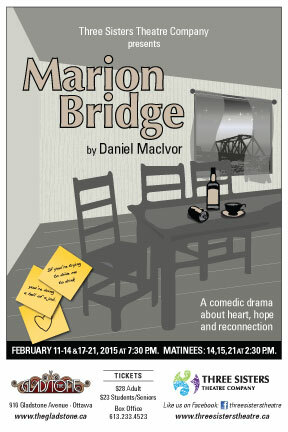 Nope, it’s the lyrical, poignant, funny play Marion Bridge, by award winning Canadian playwright Daniel MacIvor.When was the last time you saw a drama about three distinct, complex women that had nothing to do with their relationships with men? An assertively comedic drama about making the best out of life, Marion Bridge follows the reunion of the three McKeigan sisters as they laugh, cry, fight, and ultimately forge forward. Daniel MacIvor, author of The Best Brothers (also being produced in Ottawa in 2015), Never Swim Alone, and Cul-de-Sac, is a recipient of The Governor General’s Award and one of Canada’s most acclaimed contemporary playwrights. February 11-21, 2015, evenings 7:30, Saturday & Sunday matinees 2:30pm. Dark on Sunday & Monday nights.